As recent as five years ago, or so, WDW resort, restaurant and attraction-specific tees were virtually nonexistent for purchase on property. 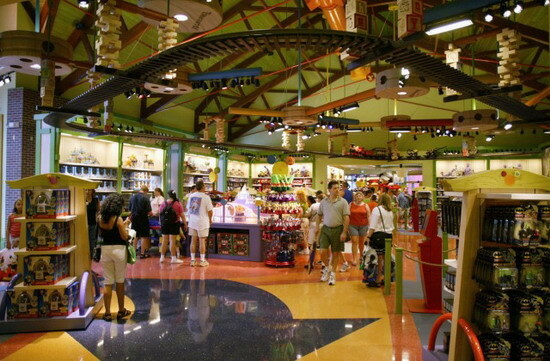 Attractions with designated gift shops, like Pirates of the Caribbean, were the exception. Gradually, over the past two years, Disney, via disneystore.com, has made strides by offering limited quantities of attraction poster and anniversary tees. While they have made progress, I would still like to have the opportunity to buy attraction, pavilion, land and or resort tees while on vacation at WDW. Personally, I would love to sport a tee proclaiming my love of Peter Pan’s Flight, Adventureland, the Emporium, ‘Ohana at Disney’s Polynesian Resort, and others. Several years ago, in select Deluxe WDW Resorts, there were small catalogues offering guests the opportunity to purchase various decorative items like those found in the resort guest rooms. Offerings were relatively generic such as the particular brand of white sheets found on the beds. I wish this idea would be expanded to allow guests to purchase the decorative bedding, lamps, side tables, furniture, and wall art. 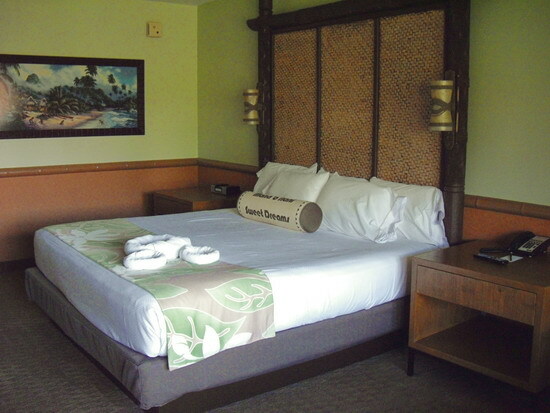 I would especially like to own the long roll pillow and bed runner found on the beds at Disney’s Polynesian Village Resort. Disney has released a few cookbooks over the years: Cooking with Mickey, Delicious Disney, and the annual Disney’s Epcot Food & Wine Festival Cookbook(s). While I love these recipe page-turns, most of them offer instructions for particular menu items found in various restaurants throughout WDW. As I have shared with readers many times before, I thoroughly enjoy fine food, but I am also mad about the classic foods available at the food carts and kiosks. I wish that Disney would publish for purchase a “Snack Cart Cookbook” dedicated solely to helping guests recreate WDW versions of beloved foods such as the corn dogs, popcorn, Dole Whip, eggrolls, funnel cakes, and more. #2 – What was that song? If you are like me, long after your vacation has ended, you find yourself humming attraction songs as well as background music. I have often wondered if Disney Imagineers, utilizing today’s technological advancements, could create an app allowing guests to hotspot download music while moving throughout the various parks and resorts. How great would it be to pull out your iPhone and quickly download the background tracks and the soundtrack for Festival of Fantasy as you stroll down Main Street, USA, or add “How Do You Do?” to your music library while you wait in line for Splash Mountain? In my mind, this line of items is so ingenious; I cannot believe the Disney Design Group has not sent it to production yet! Imagine entering your kitchen and being greeted by wafts of waffle cones and vanilla ice cream as if you stepped into the Plaza Ice Cream Parlor, or as you open your front door to welcome guests, they are greeted by the refreshing floral scent of the Polynesian lobby. This could be accomplished by means of a line of Walt Disney World candles. Other fragrance recommendations include: Buttery Main Street Popcorn, Sweet Soarin’ Orange Groves, Magic Kingdom Rose Garden, Smoky Rome Burning, PhilharMagic Apple Pie, Aloha Isle Dole Whip, or for the really adventurous – Musty Water or Big Thunder Sulfur Springs. What about you? What item would you like to be able to purchase at WDW? Which attraction or location do you wish you could sport a tee from? What WDW smell do you wish you could buy in a candle? Let us know in the comments section below! 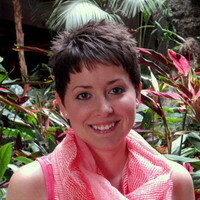 K endall is an editor and contributing writer for WDW Radio. She began visiting Walt Disney World in 1991 with her family and has continued to visit the resort with her husband. Her home-away-from-home is Disney’s Polynesian Village Resort, and she believes a perfect day at WDW includes a dip in the Lava Pool, a ride on Splash Mountain and a Pineapple Dole Whip. Follow her on Twitter @kl_foreman. I love the idea of scented candles! We start our trip at theme park connection. We picked up two animal kingdom lodge blankets for $10 last time!! I would buy a Musty Water candle in a heartbeat!! It makes me mad when I see Disney make a big deal about the Archives and even bring back Main Street Electrical Parade and Captain EO, but don’t bother to give us some of the source material from extinct attractions. Some of the audio I have is recorded from a speaker. Candles!! Nothing evokes WDW like the aromas. Please hurry production!! I completely agree that there should be more music from the parks available, especially background music. That candle idea is on point. I would love to see unique items in every store at WDW. That is each store you go in should have something unique that cannot be found in any other store. It seems to me that all of the shops are the “same old, same old” now. And you can just go to “World of Disney” to find anything that you saw in any shop. We would thoroughly enjoy having all the music (via CD)from the Walt Disney Today channel at the Grand Floridian Resort & Spa. Sadly, it has recently been replaced by a less “magical” soundtrack loop. The most amazing thing occurred when my then Fiancée and I stayed at the Animal Kingdom Lodge- Kidani Village during Christmas was the music loop played inside the resort! An African culture twist on Yuletide favorites! I want the resorts to sell their Christmas music! I would buy that it a heartbeat! I would DEFINITLEY buy a truckload of candles with WDW scents! Great idea. The sister company to Enviroscent(which makes scent blowers and scents for residential/commercial use) is one of the suppliers to WDW resorts and inside theme park smells like the Confectionary among more you smell just outside while visiting parks to attract customers to follow their nose. Or the scent of the Contemporary resort or Yacht club. A few of these scents are available for the public to buy along with a scent blower to make your home smell like you’re there. -Listen to the soundtrack to the fire works show at Epcot on my headphones (very loudly and with an adult beverage). -Setting the stage to create the feel of being on the grounds of the Polynesian and the Oasis in Animal Kingdom at night.Were fortunate to have a backyard that includes a huge freeform pool that is almost surrounded by lush foliage and a 10 feet tall waterfall and an outdoor sound system to die for. So, after dark, we turn on the fall (which sounds like the one that was in the Poly lobby),turn off all the house lights,start the sound track,light tiki torches around the pool and enjoy. Oh, if anyone is interested, the sound track we play for this experience is titled “Rythym”a real music sampler and it should be available from Real Music at http://www.realmusic.com or amazon. -There is a certain room in our house that smells so much like being in a monorail car. I,ll stay in this room for 10-20 minutes sometimes! -I am guilty of bringing Mickey soap home to bath with and using the wrapper as a book mark for my Disney book collection. is”Papillon(on the wings of the butterfly” by David Arkenstone.This one can be heard in the innoventions area. Thanks for letting me share and just so you know, this is the very first response I have made to any Disney enthusiast group.Im glad its yours. Thank you to everyone for your wonderful comments! It sounds like your two favorites on my list are the line of candles and the ability to purchase park music. Music and smells are so often and easily linked to our memories which is probably why we all wish we could carry them home with us. These two have the ability to take us back to a moment or memory that we long to revisit. Ashley, thank you for sharing all the ways you bring home the magic, and I am so glad you decided join the conversation! It sounds like your backyard is a paradise; I can only imagine how wonderful that must be to enjoy! I, too, bring home all of the in-room toiletries and ration them in an effort to make them last until my next trip. Thank goodness disneystore.com has started selling the H2O+ products; however, I do miss the smell of the “Everybody Neat and Pretty” toiletries that came in the red, white and black Mickey boxes and wrappers, though. I am pretty sure I actually saw some of those for sale on eBay. I would imagine they have lost there scent by now! I remember when I worked at WDW and guests were able to buy certain sauces, spices and condiments from many of the WDW restaurants. I especially remember bottles of the barbecue sauce from Flametree Barbecue from Animal Kingdom, among many others. Still wish Disney would put that line of products out again. I also agree about bringing back the printed t’s, embroidered polos and other products from ALL the resorts. I remember when I stayed on Disney property the first time and saw the embroidered (sp) shirt representing the Caribbean Beach Resort. 23 years (and a few pounds heavier), I had to give away that shirt again. Glad I still have my polo from Wilderness Lodge from my trip its first Christmas the year it opened in 1994. Paul, they are once again offering some of the Flame Tree items at Zuri’s Sweets in AK! Oh my gosh, Kendall! First the “Shark Tank Store” and now “Disney Park Candles”. Disney needs to hire you. All of the above are great souvenir ideas, but I like the candle one the best. You should contact Disney, Yankee Candle Co., Slatkin Candle Co., Luminara, etc. Like most people who go to WDW, I have very specific memories attached to several of the wonderful and some of the not so “wonderful” aromas there. I would try to be the first in line for candles like Authentic WDW Popcorn, Mickey Caramel Apple, Mickey Chocolate Coated Ice Cream Bar, EPCOT F&W Festival Fine Wine, just to name a few. I prefer food fragranced candles over floral ones; even so, I’m sure lots of other people would love to have a Polynesian Garden candle, or an Epcot Flower and Garden Festival one, and so on. The sky’s the limit when it comes to WDW Resort fragrances, not to mention all the ones from other Disney Parks, Resorts, and the Cruise Line, too. FYI: I mentioned “Luminara” earlier. You may or may not be familiar with the company or its realistic wax and or resin candles. 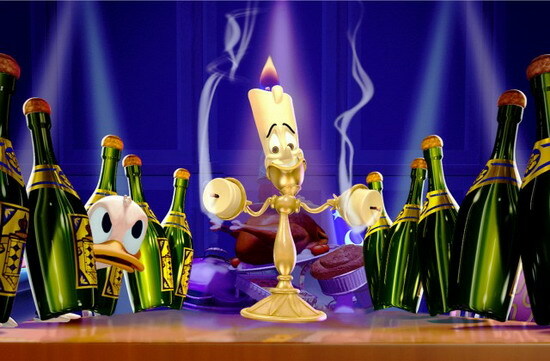 They are the company whose flameless candles utilize the original Imagineer-developed magnetic technology used to create the flickering candles displayed in the Haunted Mansion as well as in several other attractions throughout the parks. They are incredibly realistic and quite impressive! If you’re interested, Luminara candles are available at places like Hallmark, Wayfair, eBay, QVC, to name a few retailers. Anyway, while Luminara makes most of their candles scent-free, they do manufacture some with fragrances like vanilla, for example. Can you imagine being able to get Disney Park fragrances and Imagineer technology all rolled into one. I would buy multiples of those without hesitating. Thanks for putting these ideas out there, Kendall. Maybe the powers that be at Disney are reading this blog… we can hope, right?